SAN FRANCISCO, Feb. 14, 2018 /PRNewswire/ -- People traveling through San Francisco International Airport will be romanced with serenades, chocolates and a one-of-a-kind Valentine when they fly through Terminal 2 today. 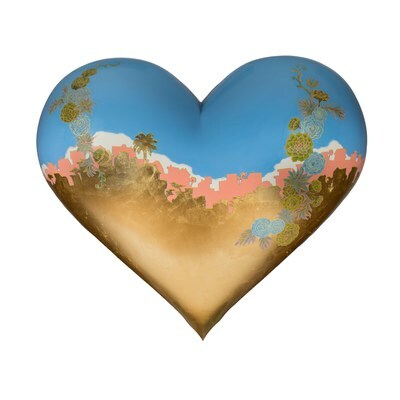 Alaska Airlines and San Francisco General Hospital Foundation (SFGHF) unveiled a giant, sky blue and gold heart sculpture as part of the Hearts in San Francisco program which will have a semi-permanent place at the airport. Designed by artist Gina Teichert, the sculpture titled Outerlands, signifies Alaska Airlines' ongoing commitment to delivering kind-hearted service to the Bay Area community. Alaska Airlines' new partnership with San Francisco General Hospital Foundation supports ground-breaking research and healthcare access at Zuckerberg San Francisco General Hospital and Trauma Center (ZSFG). With its own focus on caring service and community, Alaska Airlines is proud to assist ZSFG, which has served the Bay Area community with world-class healthcare for generations. "Genuine, caring service is at the heart of Alaska Airlines and San Francisco General Hospital Foundation's community commitments. Reminiscent of the official anthem for the city, we are delighted to leave our heart here in San Francisco," said Annabel Chang, Alaska Airlines' vice president of the Bay Area. "It's fair to say Alaska Airlines and Virgin America employees have a big crush on the Bay Area. We're thrilled to connect with local residents through important community partnerships like the Foundation's Hearts in San Franciscoprogram. Alaska Airlines hopes guests traveling through SFO will enjoy a warm welcome to the City by the Bay in the form of this beautiful heart." Teichert's sculpture was inspired by the gilded rays of sun as it breaks through the fog on an overcast San Francisco day. Gold leaf illuminates the sculpture and is a nod to San Francisco's Gold Rush history. The Hearts in San Francisco program originated in 2004, bringing the community and visitors together through public works of art. To date, more than 350 hearts have been created to help raise over $11 million to fund vital programs at Zuckerberg San Francisco General Hospital. Notably, the Terminal 2 work of art is the 214 large heart created, a fun link to Valentine's Day. "We are grateful to Alaska Airlines for bringing an iconic heart to our city's airport and sharing the importance of Zuckerberg San Francisco General Hospital and Trauma Center with the region's residents, workers and visitors," said Judy Guggenhime, San Francisco General Hospital Foundation Board chair. "Gina's sculpture will welcome travelers to SFO in style and brighten their journey. We are honored to have a heart installed in Terminal 2 at SFO." The five-foot tall heart, made of fiberglass and weighing 400 pounds, will be hard to miss in the Terminal 2 food court this spring after it makes its public, temporary debut at the Foundation's annual Heroes & Hearts luncheon on February 15. "As the premier gateway airport for the San Francisco Bay Area, we are proud to house the only heart sculpture at SFO in Terminal 2," said Airport Director Ivar C. Satero. "With this display, travelers from around the world will know Alaska Airlines' true commitment to the San Francisco Bay Area." "This heart sculpture is not only a testament to Alaska Airlines' commitment to the San Francisco International Airport and its passengers, but also to the city of San Francisco and its residents," said Mayor Mark Farrell. "Zuckerberg San Francisco General is one of the city's most revered and respected institutions, and the Alaska Airlines partnership is another opportunity to highlight the great work that is carried out every day at the hospital." Alaska Airlines currently offers 80 daily nonstop flights to 35 destinations from SFO.